Let me go on record as saying that this is the only book I have read twice through before writing up a review of it. I also have to go on record as saying that I'm not quite sure I'm really ready to write a review. As Stephanie said, (and the subtitle suggests), the basic idea behind this book is that instead of satisfying yourself with food, you should satisfy yourself with a deeper walk with God. Cue the "blah, blah, blahs" that are probably running in your head. Oh, you might as well admit it! I can hear them because the "blah blahs" were in my head as well. You want to know what the big deal is (or should be) turning your eating habits into a spiritual matter. Should that even be the case? Well, I think that Lysa Terkeurst makes a pretty compelling argument for exactly why that should be the case. - When you are upset about something, how frequently do you indulge in "just a little treat" (i.e., chocolate?) to help yourself over the emotional hurdle? - When the baby won't quit crying, how many times have you stormed into the kitchen and grabbed a coke to sit and relax with? - When your friends are telling you "it's ok" to break your diet "just this once", how often do you allow yourself to indulge, even when you know you shouldn't? - When you are ecstatically happy about something, how many times do you go out to eat and order greasy (but fun and oh so delicious!!) food to celebrate with? - When is ice cream called upon to act as a soothing balm? - When you are uptight, tired, emotional drained, etc., how often do you turn to food to cover up your emotions? Ask yourself those questions. And if food is your go-to source on any level for calming you down or carrying you through any type of upheaval, you might want to read this book. I picked up Made to Crave before birthing Bookworm3, thinking it would be a kick-start to the post-baby weight diet. I just assumed it would be a gentle nudge which would motivate me to drop the baby pounds (which are merciless, let me tell you!) It did that. Surely, it did. However, it motivated me in unexpected ways. 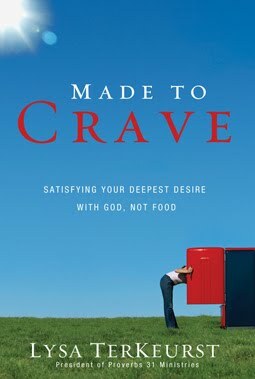 Made to Crave is most emphatically not a diet book and Terkeurst is very clear on that point. She is not on a diet and she is not encouraging her reader to be on a diet. What she is doing with this book is making the reader examine their relationship with God and answer honestly how many times they turn to Him to help them through life's victories and disappointments in comparison to how many times they turn to food. It is a very convicting read and I re-read it (immediately upon finishing it) because I would really like her message to sink in. I do not rely on God as much as I ought. I do not turn to Him first to praise Him for victories. I do make a grab for the chocolate when the children's noises have disrupted my peace and I feel the need to de-stress. I do think of how I want to treat myself at the end of a hard day. I do not always turn to scriptures or prayer first when emotionally challenged. I forget that I am a child of God and He can see me through my darkest hours. I like food. Sometimes I like food more than I like being a Child of God. It is obvious that I do because I turn to it first more often than I'd care to admit. So I read this book. And then I thought, "PPpwwhhht!! !...Stephanie's going to wonder what I thought of it and I'm going to have to tell her." Then I thought: "Furthermore, I mentioned on RtK that I was reading this book and I feel like I have to follow up on that." Made to Crave goes beyond the food choices and discusses why you make the choices that you do. Not in a Jillian Michaels, "I'll scream in your face until you do what I say!" sort of way. Rather, Lysa Terkeurst is meek, humble, and honest as she presents her own journey of learning self discipline and self control in a way that is easy to relate to, identify with and be easily convicted by. But I have to then (honestly) say that I recommend it because I want you to be equally convicted that you need a closer, honest, more trusting relationship with God so that I won't look so deficient. I want you to feel bad so that I'll feel better about myself. Which is totally not the point of the book but it is how I feel about it! Go! Read it! Make a change WITH me. Scripturally based, God-oriented, and prayerfully directed, this book will take you far beyond thinking about your diet choices. I think it will rock your world. And you might just re-read it a time or two yourself! Thanks Stephanie for this read. I'm genuinely appreciative. Pphhhwwwwt!!! By the way, "the other" Stephanie also read it and you can read her review at Simple Things. She didn't really want to write about it either. When I was reading your review I was thinking about boredom eating/snacking. And then how I may eat a small meal but need to come back for more food later. How often do I read just a bit of the Bible or begin to communicate with God...but don't follow up the way I must if I don't eat a complete meal? My mother in law was raving about this book too. Seriously, I've seen it mentioned several places and know I probably "should" read it but just haven't gotten the gumption yet, maybe because I know it will be convicting. I think when I first heard of it I was a little put off because I get tired of scenarios on Biggest Loser or Extreme Makeover: Weight Loss Edition where someone's deep dark secret is what is supposedly causing them to gain weight. I usually think, "It isn't always a deep dark secret. Sometimes people gain weight just simply because they don't like to eat the right things or they just eat too much or they don't exercise enough, plain and simple." And that's true, but I do tend to go to food as comfort, too, and the author seems to be talking about that more than the other. Well, I think it's time to pull this book back of the shelf! I have the DVD and guide that goes with the book. My plan was to study it all as a devotional every morning to keep me on track...but I haven't! @Barbara H. - Definitely NOT a Biggest Loser kind of book. More like a Biggest Gainer if you apply what you read. In a good sort of way, of course. =) Personally I think you would really like this book. A lot. I think you could address it more intelligently than I did here. @Bluerose - This was my first "bathroom read" actually. I think if I had to make myself sift through a video, I would have a harder time getting to it. But if I read a chapter here and there in the morning and evening, it not only provided lots of things to think about for the day but I moved through it more slowly, letting it sink in a bit more. @Taia - No, she doesn't talk about fasting. And I feel woozy and light headed as well when I don't eat. Not eating is not an option for me as far as I'm concerned. But fasting particular things that I'm fond of - that's more where I tend to fall on the fasting issue. I've been looking forward to your review of this book. I requested it from my library last year and by the time it came it I found out I was pregnant so it promptly went back. I figured I didn't need to read it now. I think I might be wrong about that since it sounds like a book I need to read for more than just the food area of my life. (ahem!) Maybe I'll actually try to read it before the baby arrives. On the baby note, any big brother/new baby book recommendations? Sounds like a good book to pick up. I think that in our American society we get used to the panacea of the quick fix that doesnt address the real issue at hand. As Christians we believe that God is the answer, so why don't we trust Him in all aspects of life? I once heard a Russian pastor say that it was easier to be a Christian in his country then in the USA; when your very meals rely upon Gods grace you have to give it to Him. Waaaaaaah. I don't wanna read it, but I need to read it. I've been trying to decide whether or not to purchase this book. Your review is incredible. So many reviews just rehash whatever the back cover says, but your words are personal and interesting. Thanks for sharing this on here! I actually lost quite a bit of weight last year doing what (I think) this book suggests - learning portion control and running to God, not food, for comfort and joy and peace and so on. It totally sounds "blah blah blah" when I type it that way :) but it was a healing season for me. It's good to know other women struggle with that same issue. This seems like a great book to read as I journey along and stay committed. Thanks for sharing your thoughts. I'm bookmarking your blog! I've heard good things about this book, but I totally admit to the "blah blah blahs" about it! Your review, however, makes me really want to read it. Terrific review. Finally finding a second to comment on this post ... I need to go back and reread (it's been, what, six weeks?) Yesterday was one of those days where if there had been any kind of chex mix or random potato chips in the house ... whew. Now why do you think I recommended this book to everyone? Conviction loves company! I was a little nervous that you wouldn't like the book. I really believe the principles Lysa shares can be applied to many areas of life, she just applies them to food and weight loss. Which unfortunately turns a lot of people off. She definitely changed my view of food and eating.